The Underground Glasgow is one of Glasgow's most fascinating pubs due to its friendly environment and unique architecture. This pub provides pool tables, free WI-Fi and an excellent jukebox. Moreover, The Underground Glasgow is great for groups; credit cards are accepted and the best nights here are Friday and Saturday. The variety of people coming here creates a multicultural environment. Therefore, The Underground Glasgow is one of the best gay pubs in town! 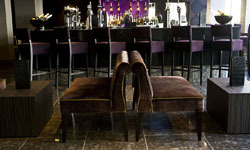 One of the most famous gay bars in Glasgow, the Polo Lounge, is a remarkable place with excellent relaxing conditions. The best two things about this place are definitely its unique design and the fact that it has affordable prices. Every Wednesday the entry is free and the general atmosphere is great. People come here for several reasons, but most of all for its up to date music. So, if you look for a place to chill out, come and visit the Polo Lounge! After a hard day at work, this place is the perfect one for you. A relaxing environment with good music and friendly staff make the Social pub to be one of the most welcoming pubs in Glasgow. Due to the great variety of beers and the warm glow, here you can experience some wonderful moments together with your friends. The interior of the pub is nicely decorated, and as a result, this pub will make you come for some more. 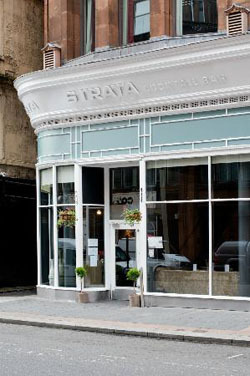 During the day, here you will find an excellent place to relax, while the nights in this pub will be your perfect opportunity to escape and experience Glasgow's hectic nightlife. 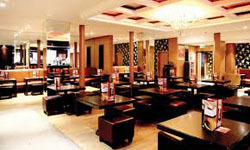 If you want to taste a strong coffee, a good cocktail or if you want to enjoy a cold beer, the Cocktail & Burger pub might be the place for you. The food is brilliant and the prices are reasonable. What are you waiting for? Go and have fun! Private parties, special events, thematic gatherings or just a night out, you can find them all in the Bilberry Cocktail Bar. Close to several tourist attractions, this pub might be your place to regain your strength after a shopping session, or a long walk. The cocktail, which gives the pub's name – 'The Bilberry', is obviously the most representative one and it will be a loss not to taste it as you come here. Try it! Do you wonder what the strong points of this bar are? Well, it is obvious - not a very crowded place, close to the city center, with a great variety of drinks and hospitable staff. Some of the best chefs in the city will give their best to make the tastiest food for you while the bartenders will get you an unforgettable drink. In order to decide upon the quality of the services, you just have to come and see it for yourself. Since 1987 this bar has welcomed people of all ages, different generations all linked by a good taste of music – the rock music. The free WI-Fi, the cool atmosphere, the food and the friendly people will definitely make you come for some more. 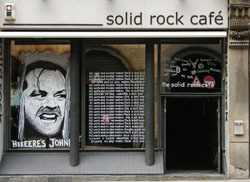 One of Glasgow's best pubs, The Solid Rock Café can be your choice for a night out with your friends. This pub is great for groups, but can also be an option for a small talk with an acquaintance. • The cheap beer and the rock music makes it the perfect place for all the rockers in the city. Rock onnnn - Sue.